Borrowing from the ERECTOR SET ® Concept, we’ve created a building block System of snap and screw together plastic parts that connect to generic liquid level Sensors, flow sensors, temperature sensors, pump controls and relays. The flexibility, adaptability, quickness and cost advantage of this concept makes everything easier for the OEM equipment builder. The factorial of liquid level sensor, flow sensor and temperature sensor solutions are mind-boggling. Incredibly, stock ERECTA SWITCH solutions are in the millions. What was custom, engineering intensive, or too expensive is now quick and affordable using "out of the box" components and sets. 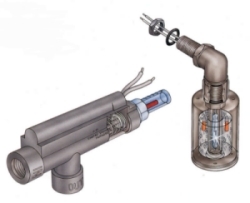 All liquid level sensors, flow sensors and temperature sensors and accessory parts are manufactured in Polypropylene, Acetal, and Kynar for compatibility in the widest spectrum of chemical environments such as water, acids, caustics, hydrocarbons, ultra pure, and other corrosive chemicals.